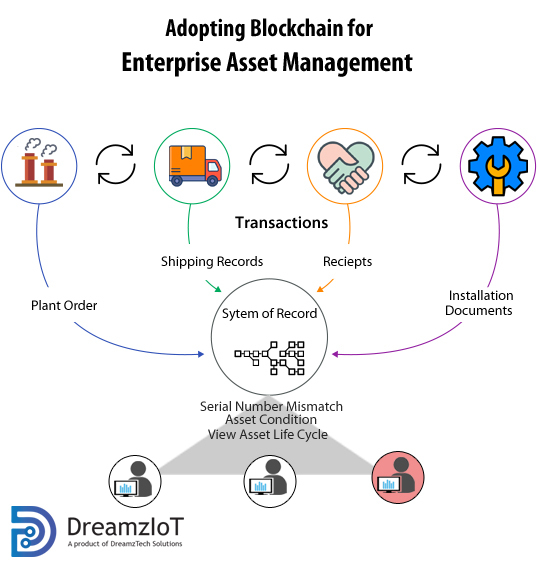 The DreamzIoT explores enterprise asset management (EAM) and blockchain, examining the benefits and challenges of this two technology together. While blockchain technology has benefits in many applications, enterprise asset management has until recently is operating in a traditional way. Recently, organizations have been taking early steps toward using blockchain within EAM applications. Industries face a challenging business environment due to continuing margin pressure, global competition. At the same time, they have to tackle with issues such as limited asset management in supply chain visibility, empowered consumers, high transaction fees and the battle with counterfeit products. Industries can be benefited and address these issues by using Blockchain. Blockchain technology has created the opportunity for nearly every major industries to tackle its major issues. Transactions through peer-to-peer, distributed and timestamping creates more transparency, trust and faster process that replaces the traditional role of a central trusted authority. Data is the driving factor for the asset management these days. improving its existing business processes and Blockchain enabled processes will lead to higher customer satisfaction, improved customer buying habits, more secured transactions, and higher profit margins. Since blockchain’s decentralized architecture lies an autonomous consensus protocol that relies on no central authority. This consensus mechanism facilitates agreement across a broad base community that immutability verifies the information stored on the blockchain. This enables the data written to a blockchain, cannot be changed, altered, or corrupted. In order to write or make alterations to the ledger, an individual/stakeholder will have to be authorized to utilize the system. When they make a change to the data related to a specific asset, they will stipulate the desired change and then scan the IoT Sensors/RFID tag to write the proposed change to the blockchain. In doing so, the system will identify the asset, when the change was made, who made it, and the data entry point. DreamzIoT has implemented the Blockchain and IoT based asset management solution for the client’s to track and control the assets efficiently as it moves along the supply chain.